The Writings of Cassidy Cornblatt | Wisdom from the author of A Broken World & Discordant Tones. It amazes me sometimes the amount of time that can be spent thinking about setting before you can even begin writing. I am currently working on a story for a creative writing class that I am taking. The story is supposed to be an homage to “Cities and the Dead” by Italo Calvino, which describes a person’s arrival in a city where everyone is dead including himself. The idea for my project is to explore this setting since Calvino’s story ends with the reveal. This is a city where the people know they are dead, and yet they act like they are alive. My goal is to explore how a person’s life would be in such a city. When I decided to write this particular story, I did not realize that I would have to spend so much time deciding exactly what the city is like and how it functions. It is hard to write about someone’s life in a city without knowing the city’s layout, the jobs available, housing options, etc. I have now spent quite a while determining how the person came to the city, whether or not he arrived in the same clothes he died in, and how the currency system of the city works. Some of these things that I had to address might seem inconsequential, but without fully fleshing out the setting, it is difficult to get a grasp on how someone would interact with their surroundings. This is often an issue with fictional settings, something I come across all the time when writing fantasy. World building is an essential part of a story. It determines the backdrop for all of the plot and character interactions. A conversation about lunch would be quite different on a college campus than on a stone bridge over a river of lava. This is why setting has to be well-defined. It creates backstory in itself and can help the narrative to tell a story. Setting is often the foundation for good writing. It’s a question I hear a lot, and I’m sure other authors experience the same thing. Everyone wants to know about your inspiration. They want to know your inspiration for writing a certain novel, inspiration for writing a particular genre, and inspiration for writing in general. Basically, what got you started, and where did your ideas come from? You would think this would be an easy question to answer, but, for me at least, it’s rather complicated. Rarely do I have a single event trigger the writing of a novel. Most of the time, it’s a combination of factors. Luckily I have a decent story about the inspiration behind the trilogy I am currently working on, which starts with the recently published Discordant Tones. It goes as follows: “I was on a family vacation at Cape May, New Jersey a few years ago. I was sleeping in an RV in the driveway since there was not enough room in the house for everyone who was there, and I had an interesting dream. I dreamt that I was walking through a library, and I happened to see three books on a shelf with my name on the spine. When I woke up, I decided I should write a trilogy.” I told this story to a reporter from my university’s newspaper, and she liked it, including it in an article about me (see the article here). However, she did still ask what my inspiration was behind the content in Discordant Tones. For this I did not have as good an answer. Much of the storyline of Discordant Tones was inspired by the world I described in my first book, A Broken World. The situation is similar, but the characters are different and it is set many years later. I did not have some grand inspirational moment that caused me to write A Broken World either. It was a combination of factors. I was definitely influenced by books I’ve read, movies I’ve watched, and events in my life, but I cannot point to a singular interesting occurrence as the inspiration. That means I don’t have a good story to tell when people ask. Have you ever been asked about your inspiration? How do you respond? Do you have a story about the origin of your story? Having recently published my second novel, Discordant Tones, I am now in need of reviewers. I have sent e-mails to a number of book review bloggers, but there is a rather long wait time since they receive review requests quite frequently. For this reason, I now turn to anyone interested. If you would like to receive a free e-book copy in exchange for writing an honest review, either click here or go to the tab at the top of the screen labeled Review Copy Request Form. There is a short and easy form to fill out to indicate interest so that I can get in contact with you in order to send you your free copy. Discordant Tones is a young adult fantasy of 358 pages in paperback form. 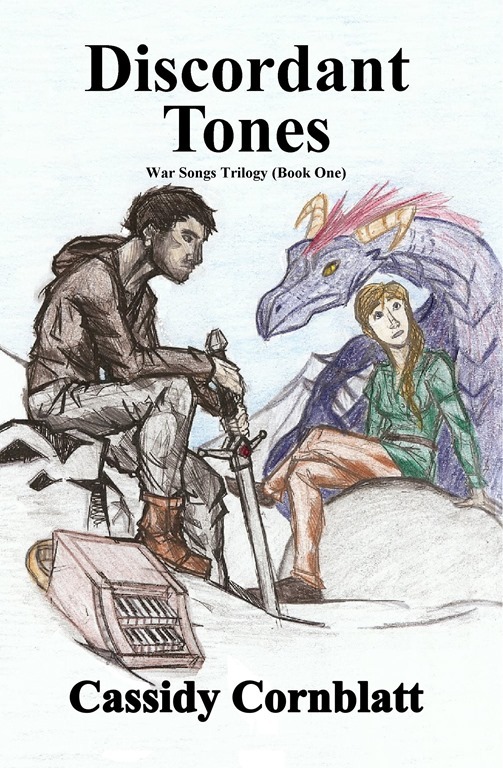 This is the synopsis: After growing up in an ever-expanding refugee settlement due to a never-ending war, Trent, Dreth, and Alyssa are tasked with covertly exploring the warring kingdoms to find out new information concerning the conflict. Armed only with magic they use through music and Dreth’s shape-shifting abilities, these companions face powerful threats and uncover deeper secrets than they could ever imagine. Coming of age in a war-torn land is not easy, and they quickly find themselves at the center of the conflict. It is up to them to end the war, but do they have what it takes? Coming soon: the new book Shadows and Embers by Lindsey Sablowski (expected publication date July 26). This is the second book of the Magicians series. The first book was Cursed with Power. Summary: It’s 1569 in Transylvania; Léal Irvine has committed to a powerful man all for the sake of revenge. Handsome, young Irvine is a high-ranking magician working for Esmour’s organization, Destin, which is composed of Dark magicians from around the local areas. However, one by one magicians vanish or die, and suddenly the world of magic is not as safe as it once was. One of the members and Léal’s best friend, Nicia, betrays the organization before the downfall. Unfortunately no one realizes the act of treason might have saved her life. A year later Destin has fallen, and Léal sees the world through icy blue eyes. With only five Dark magicians alive his survival is constantly threatened, and he has no great leader or trusted allies to turn to. After infiltrating Belsgar and killing a member of the Magic Council, the war between darkness and light is no longer something anyone can walk away from. A new villain rises with a secret that could be deadly; meanwhile Nicia works to prove her loyalty to Léal while trying to revive their friendship. Sides will be chosen, relationships will be at stake, and in the end the balance of the magical world will depend on the outcome of the war. When you’re walking on a thin line between revenge and forgiveness how do you choose the right path without stepping too far over the crack? Discordant Tones Is Now Published! I have just published Discordant Tones, the first book in the War Songs Trilogy. A Broken World is the prequel to this trilogy, but it is not necessary to read it beforehand. Discordant Tones is available on Amazon in both print and Kindle versions. Buy your copy today! Description: After growing up in an ever-expanding refugee settlement due to a never-ending war, Trent, Dreth, and Alyssa are tasked with covertly exploring the warring kingdoms to find out new information concerning the conflict. Armed only with magic they use through music and Dreth’s shape-shifting abilities, these companions face powerful threats and uncover deeper secrets than they could ever imagine. Coming of age in a war-torn land is not easy, and they quickly find themselves at the center of the conflict. It is up to them to end the war, but do they have what it takes? Print – currently on sale for a reduced price of $14.24 (regularly $14.99). Kindle – $4.95 or free to borrow for Amazon Prime members.